Portland by night, originally uploaded by The Bacher Family. 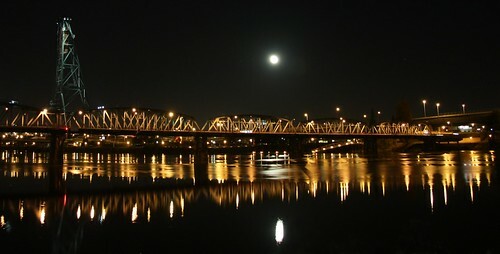 During a visit to Portland, I found myself out after dark after eating dinner, enjoying the city lights reflected over the Willamette River. The moon--full or nearly so--hung low in the sky over the bridge, visible through a light haze of low clouds and reflected in the water. I didn't have a tripod, so balanced my camera on a rock wall to take several photos, then cropped out the vegetation in the foreground for this panoramic view of the bridge at night.